The Beatles performed a single show at this venue in Milwaukee, Wisconsin, USA – their only such performance in the state. The Beatles' aeroplane landed at Milwaukee County Airport (now called Mitchell International Airport). They were taken to the National Guard headquarters on the east side of Mitchell Field, away from the crowd, leaving behind hundreds of disappointed fans. They were then driven by limousine to the Coach House Motor Inn. The police told us we couldn't go past. It's mean not to let 'em have a wave. It's a lousy deal, a dirty trick. At the hotel a press conference was held; John Lennon was suffering from a sore throat so didn't take part. Tickets were priced at $2.50, $3.50, $4.50 and $5.50, and had gone on sale in April 1964. Within a week all 12,000 had sold out. Also on the bill were The Bill Black Combo, The Exciters, Clarence 'Frogman' Henry, and Jackie DeShannon. Security was tight around the arena, as the Milwaukee authorities feared the effects of Beatlemania. The Beatles arrived in the city by aeroplane in the afternoon, and were met by around 700 fans. Fifty police officers and 30 county deputies had difficulty restraining the fans, despite makeshift fences being erected, and officers with fire hoses stood by. At one point around 100 fans broke through the cordon and rushed towards an approaching plane. During the show the Red Cross posted 18 people around the venue, armed with ammonia and other inhalants, and treated at least 10 fainting girls. The Beatles performed their usual 30-minute set, arriving on stage shortly after 9pm. 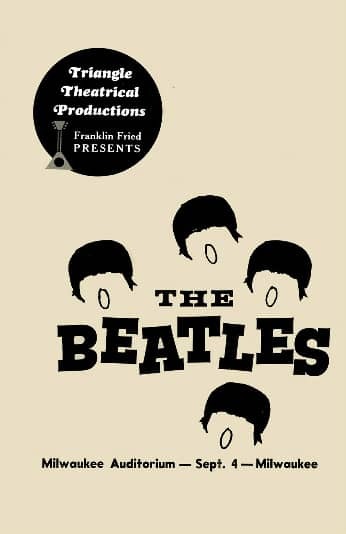 They played Twist And Shout, You Can't Do That, All My Loving, She Loves You, Things We Said Today, Roll Over Beethoven, Can't Buy Me Love, If I Fell, I Want To Hold Your Hand, Boys, A Hard Day's Night and Long Tall Sally. After the show fans assembled outside the Coach House Motor Inn, on West Wisconsin Avenue and 19th Street, where The Beatles were staying. Some stood in front of the building all night, but were mostly well behaved. Inside the hotel the band ate dinner and were given antibiotic shots to alleviate their colds. The next morning fans invaded their suite and took all available mementos of The Beatles' stay. Hi! My name is Marilynn…I’m the mid-day DJ on Milwaukee’s classic rock station, a life-long Milwaukee-area resident…and I need to make an important correction on this page re: the Beatles tour stop in Milwaukee on September 4, 1964. The Beatles flew into Milwaukee on a regular commercial airline and the plane pulled into a regular commercial gate at the Milwaukee County Airport (now called Mitchell International Airport.) How do I know this for fact? I was on the plane at the gate right next to the one where the Beatles’ plane had landed, waiting to leave on a family vacation to Denver. Due to all the commotion (and you have to remember that this was back in the day when passengers walked out of the plane door and then down those metal steps outside of the concourse), our plane was delayed taking off. Our pilot even came on the intercom and told us why we were delayed and said that if we looked out of the right side windows of our plane, we could see the Beatles standing at the top of the steps of their plane, waving to the throngs of teenagers that had gathered at the airport! I’m guessing (and I’m pretty sure I’ve actually heard this) that the Beatles were shuttled from the plane by an airport vehicle to the east side of the airport (where the Nat’l Guard buildings & runway were), rather than walk through the passenger concourse and then transferred to another vehicle (a limo, I presume) and left from that Nat’l Guard roadway. By the way – the Coach House Motor Inn became a Holiday Inn several years after the Beatles stayed there and then in late 80s or early 90s, the building was bought by Marquette University and remodeled into a dorm that is still functioning today. When I returned to school after that trip to Denver (I was just starting second grade) and told everyone about getting to see the Beatles at the airport, I remember a lot of kids didn’t believe me! I sure wish I would’ve had a camera (with a flash bulb attachment) so I could have taken a picture. Thanks for the info Marilynn! my name is joe anderson i was the waiter and only person allowed on the floor that the beatles were staying on, they did not eat at the hotel when they arrived on friday evening. i served them breakfast on saturday morning. john and paul had porridge an toast, george and ringo had toast an tea after they were thru eating i went up to there room to remove the remains. on my way down the elevator two girls were on,when they found out that was food left over from the beatles they grab the left over toast and began crushing it up an spreading it on there arms. those were the good old days at the coach house. So where is the result of the film camera the girl is holding in the film here, from about 25 seconds into it?